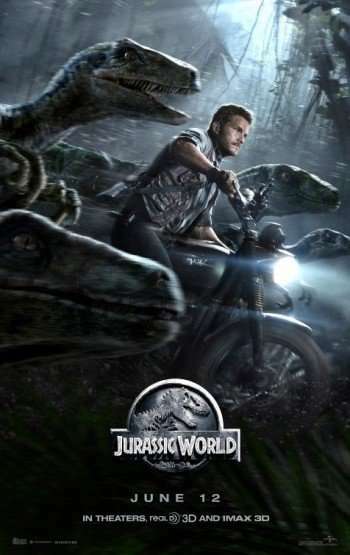 Arriving in theaters 6/12, JURASSIC WORLD is the fourth installment in the popular franchise originated over twenty years ago. Conceived by the late MICHAEL CRICHTON , the story of a theme park gone horribly wrong has managed to capture the imagination of millions of movie-goers despite (or, maybe, because of) its ongoing feeling of ‘been there, done that’. Heading the cast this time around, CHRIS PRATT admirably lives up to the title ‘leading man’ and demonstrates why he’s at the top of everybody’s casting list. Probably best known for his role as the lovable doofus, Andy Dwyer, on TV’s popular PARKS AND RECREATION, PRATT took the box-office by storm in last summer’s blockbuster franchise GUARDIANS OF THE GALAXY and is rumored to be taking over the upcoming INDIANA JONES reboot.